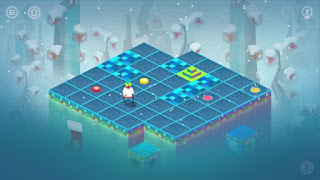 Apple are currently offering 'Roofbot: Puzzler On The Roof' by Double Coconut as their Free App of the week. 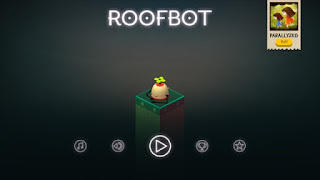 'Roofbot' is a deceptively simple game where you need to move Roofie, the protagonist of the adventure, around a gird to collect and deposit energy balls to progress through the levels. When walking around the grid, once you step off a tile it drops down and you cannot use it again. The game has gorgeous visuals, which convey an ethereal feeling to the game, you can feel the passion that the developer have put into the game. 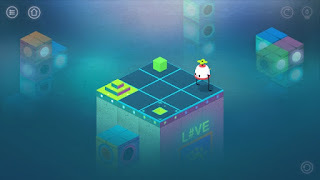 Although there is a tutorial that you need to complete as port of the levels, it was easy to pick up and start playing from the off. The one fault I found with the game, although quite minor, was that on occasions the game didn't recognise the direction of my swiping and sending the character the wrong way - meaning Roofie could fall and lose the progress made on that level. This combined with the character moving relatively slowly around the board meant it felt a chore to do the levels where this occurred. I've really enjoyed playing 'Roofbot' this week and it's got that addictive quality that all the best games have. 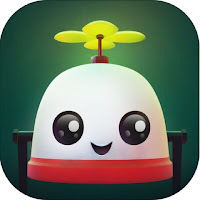 As always, I like to consider if my little boy would enjoy the free games, and I'm sure in time he will love this kind of game, but he's far too young at the moment to play 'Roofbot'. I will add that if it weren't for the slight issue about recognising where I wanted Roofie to go, we may have seen my first 5/5 review!